We spent a couple of days in Santiago, a surprisingly amorous city with canoodling couples everywhere! When the smog clears, the city is attractive with its backdrop of snowcapped Andean mountains. We enjoyed looking around the city and sampling Chilean wines in the local wineries. Next stop was Puerto Varas, a charming European style town built by German immigrants. This was our base for exploring the volcanic landscape, we trekked through the snow to Volcan Osorno and hiked across a lava river bed. We also visited the beautiful waterfalls at Rosales National Park. We then took a bus to Bariloche in Argentina. We loved our time here, we stayed right on Lake Nahuel Huapi so we had fantastic views. We trekked through the forests of Llao Llao Municipal Park (not so much snow this time!) and went horseriding. Our favourite South American city so far was Buenos Aires. It's such a vibrant city with so much history and culture - and great cafes and restaurants! We saw a lot of the sights of the city, shopped in the colourful markets, saw Evita's grave, watched the tango dancers in the streets and went to a Boca Juniors football match! The atmosphere was awesome even though Boca lost! 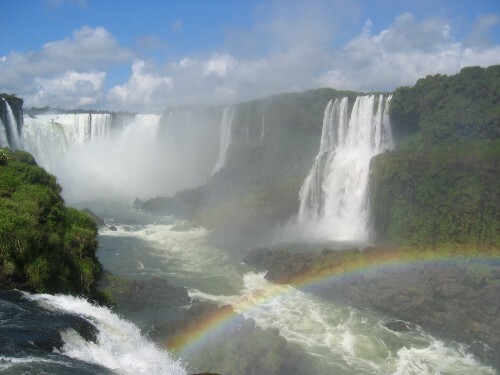 We are now in Puerto Iguazu. We have seen the spectacular Iguazu Falls from the Brazilian side and the Argentinian side and we head back into Brazil to Paraty later today.